whether a princess or a prince. but have not yet seen. to one day become a part of me. who love and cherish you. impatience, and so, so much hope. My husband and I drink tea. But only one of us really love it. Or should I say, only one of us is really obsessed. Like, if there is no tea in the house I have obviously taken it with me somewhere you will never find me. Or I drank it all. I probably drank it all. I haven’t written much since gettin’ hitched to the awesome guy I call my husband, but I have been collecting tea and coffee and the little innovations that make them so much more enjoyable. Here are a few of my favorite [tea] things. 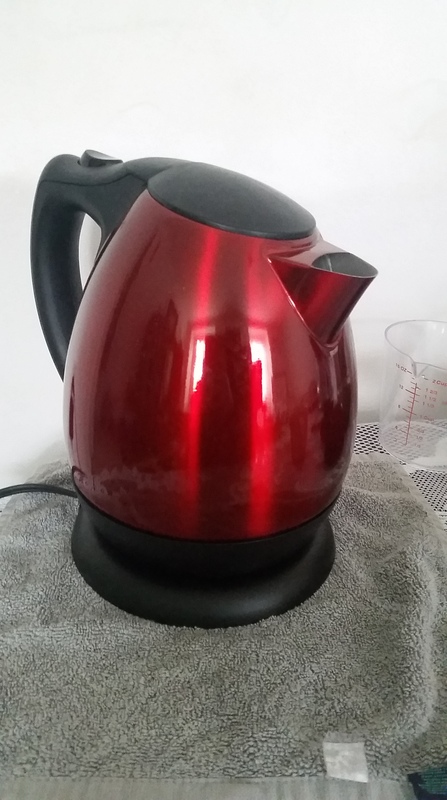 My snazzy red kettle, without which tea would take way too long to make and would require a trip to the kitchen. It was my first newlywed purchase and it’s ever so useful. A plump and pretty thing, I got it for about $30 from Amazon. The brand is Hamilton Beach. 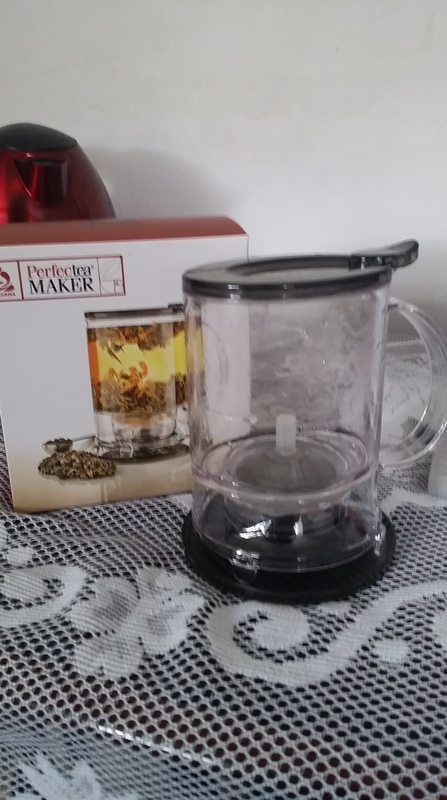 This is Teavana’s Perfectea Maker. I actually bought this for my husband thinking he’d become a tea connoisseur, but alas, this didn’t happen. To dream wildly is often its own punishment. It’s not too expensive. This one makes about two cups of tea, which is about one serving for me. I love this handy gadget because I’ve fiddled with so many loose leaf tea sieves and sieve spoons and sieve chains and sieve teapots and nothing ever really works as well as this thing. You fill it with your favorite loose leaf tea and some hot water, and let it brew. Then you place it on top of your tea mug, the rim of which pushes up on its whatchmacallit and dispenses the tea straight into your cup. Just watch how much you’re pouring, and set it down on its drain plate to catch any drops. It is plastic, but Teavana also makes a glass one, or some poly-plastic type material that looks and feels like glass. The only downside is that it’s a bit challenging to clean. Tea for two, two for tea? 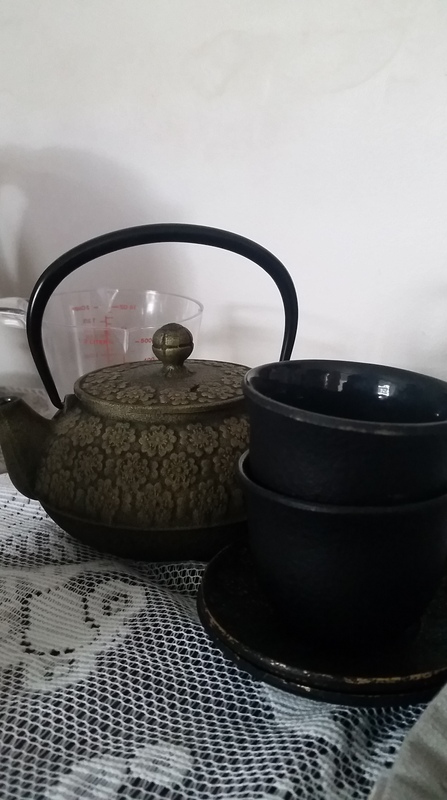 My father gave me this beautiful cast iron tea pot and tea cup set a few years ago. 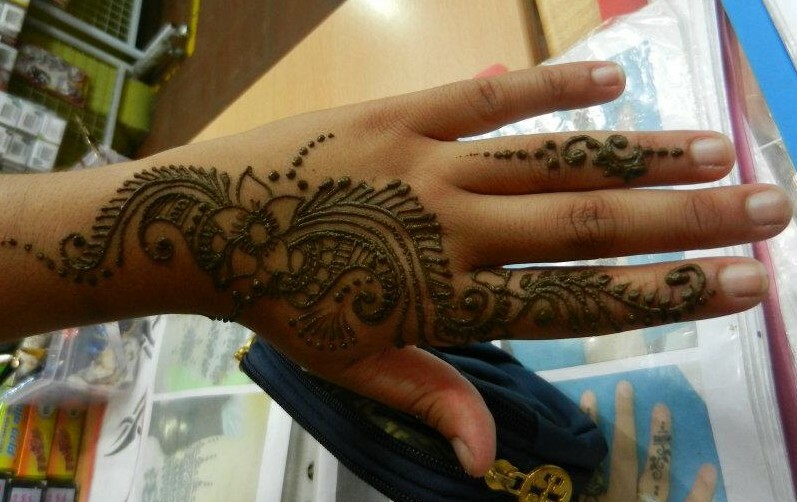 It’s wonderful to use and beautiful to look at. The floral designs on the pot are dogwood flowers and I believe the plates have them, too, if I’m not mistaken. It has a sieve attachment for loose leaf tea. It’s a pretty small teapot, you could make a nice strong green tea or some oolong in this and it would be perfect. Just a peek at my current tea collection. I have much more stashed away, somewhere. 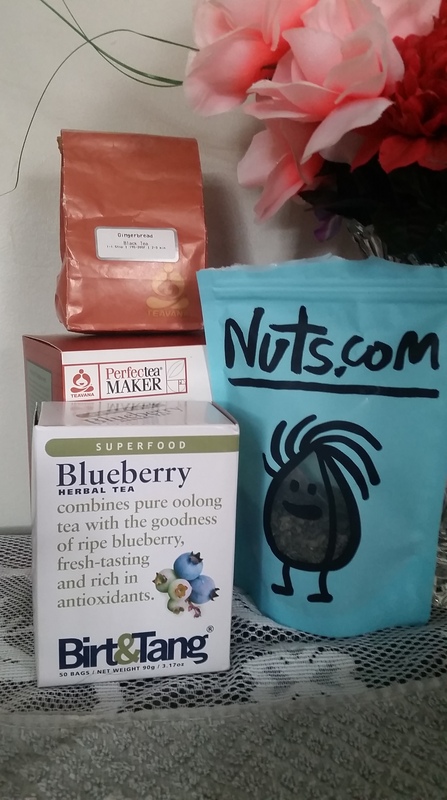 Nuts.com has more than nuts and chocolate, it has tea!! I got a bag of their gunpowder tea and their matcha tea (not pictured). Unfortunately, I don’t have a bamboo matcha whisk (soon! ), so I still have yet to try that. But the gunpowder tea is everything you think it tastes like. Bitter, strong, earthy. Husband and I are not big fans of fruit teas. He’s tried it but I haven’t had that one yet. The copper Teavana bag is filled with their gingerbread tea, which were favors from my amazing surprise bridal shower. I stole the ones left from the people who didn’t come! Bahaha! The Perfectea box is stuffed with other tea from the bridal shower. I took them all. I am without mercy. Sunny D (her real name has been modified, this is her super hero name) made teabag cookies. 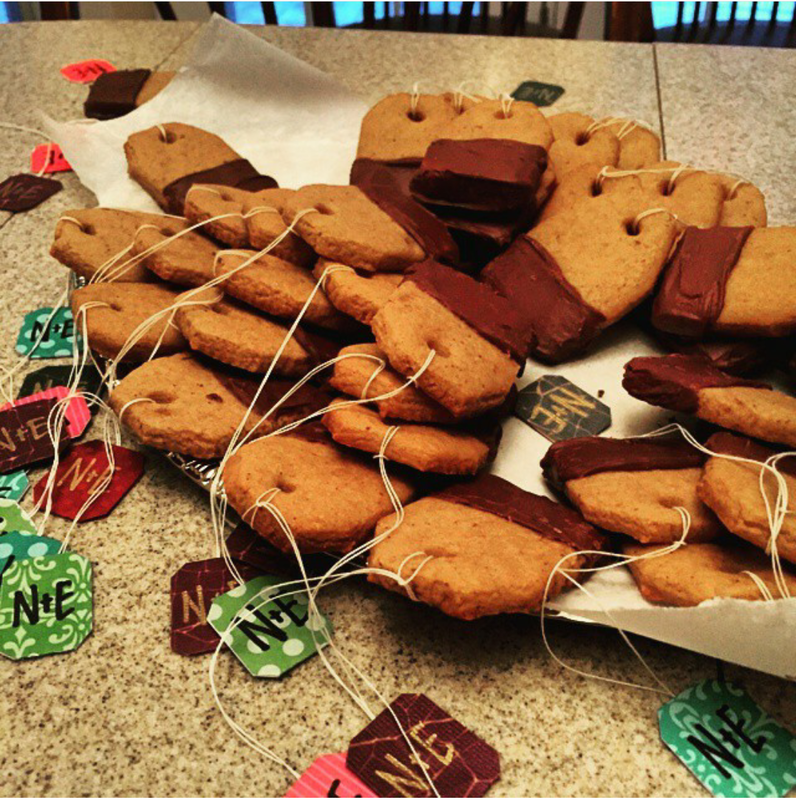 Sugar spice cookies shaped like a tea bag, dipped halfway in chocolate, and then strung with string and a label. My brain couldn’t handle the delight. I think I ate them all. Or most of them. They were amazing! Last, but never least…My tea of choice. If you’re a Desi person, or are not Desi but have a Desi spouse, like my husband, you probably, most likely, maybe have this in your kitchen. If the above applies to you and you do not have this, you’re crazy. Get outta my house and get this tea immediately. Just as good is Ahmad tea (green and yellow box). This is called Tapal Danedar (red and green box). 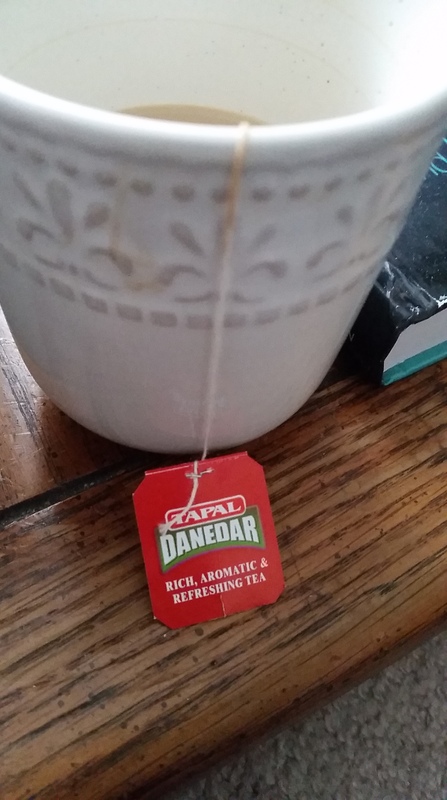 It’s a very rich and aromatic tea. I like to cook it on the stovetop with cracked green cardamom, and drink it with milk and honey, sometimes a little sugar. I used to drink this 3 or 4 times a day, then realized I couldn’t handle that much caffeine. Suffice it to say, a little goes a long way. So that’s that. I have a few other teas and tea gadgets laying around, but this is really the cream of the crop. The cream of the tea. The dregs in the cup, if you please. Since I was a child, I feel like I have been analyzing the people around me, comparing them to the state of their families, neighbors, cities, and the rest of the world. I’ve wondered why people talk so much, why some see little beyond the center of their vision, not even glancing at the peripheral. I know the value of friends – I do, I really, really do. I have turned from an introvert, to an extrovert, to an introvert again through years of schooling and friends that have all had varying degrees of influence. And I have interacted with them in various different ways, too. Sometimes being overly nice to compensate for not fitting in, and sometimes shutting myself out; too afraid to talk to anyone for fear of humiliating myself or feeling awkward, ugly, fat, stupid, conservative, liberal…what have you. As is obvious, there are very few people in this Dunya I can truly relax and be myself around. Maybe once I thought myself as someone who could cope with many friends, someone who loved people and could get along with anyone. Allah adjusted this for me. Gave me those I thought I could trust and showed me they could break me in half with barely any effort. He gave me those that love me unconditionally, and showed me that I could inflict the same harm upon them, sometimes obliterating their trust in me. Sometimes taking me out of their heart. I realized the importance of silence in the face of empty words that take up space and offer no benefit. Is that not the nature of the worst of people, the worst of habits, even the worst of foods? They fill up the space, but at best they offer nothing else. At worst, they metastasize like a malignant tumor and poison the things around them. They squeeze into the seats reserved for better things. Things that reciprocate and last, things that make an impact. And when the time comes for you to make the better choice, to choose Salah over sleep, or carrots over cookies, or wisdom over gossip, it has become habit. You are used to choosing the poison; the consequences diminished by the opiate force of routine. I cannot count on any number of fingers or toes the amount of promises I have broken for lack of respect for myself. Maybe for lack of self-esteem. Maybe motivation. Or maybe simply the habit of speaking words that carry no weight. Empty shells pretending to mean something. How can we value someone else if we do not value ourselves? How can we keep a promise to another human being, but easily break promises to our own selves? Maybe a broken promise to someone else will be forgiven. But broken promises to oneself usually go unrecognized, unpunished. They turn into the norm and we inflict harm upon ourselves quietly but steadily. The broken promise turning into addiction, abuse, sickness, lack of motivation, lack of esteem….the list goes on. No mobile app or diary will amount to the loss of potential when we betray ourselves. But maybe in silent reflection and quiet determination, in the meditation of self, we can find ourselves again. Sift through the loud, chaotic debris of the lives we lead, and just make one, quiet promise. One to keep. author’s note: this poem has elements of magic (entirely attributed to evil in the poem) that serve as metaphors in the story. What those metaphors are…is entirely up to you to interpret. But this story is meant to outline the journey from abuse, heartbreak, and trials to understanding and redemption. and along the pale shores of the sea. They cast their doubts away. but began to fear her young Lad’s ire. And became defensive of his pride. Met the mirthless bite of fate. And left through it like a door. She knew within was hollow. and memory’s wounds were deep. And an end she could not see. “What aid you offer, O stalking witches? “Lad?” Girl cried, “How can you know? It hath been spun, so long ago. A love impossible to find. “What use have you of this sparkling treasure? “Worry not of these things! It is that which we require. Forget your sentiments of that ring! then gave away her band. and shattered it to dust. to the trunk of a leafless tree. We want the band, or you’ll dearly pay! No value had it, but sentiment! To claim her youth, kill her they must! “If you wish to save Lad, you’ll pay with your life!